Madagascar, the fourth largest island on earth, is well known for its unique nature and wildlife. Throughout the country tourists have for long discovered the many amazing natural treasures aboveground, while the real treasures can be found underground - precious stones. Since the first discovery of sapphires in Ilakaka in 1998, Madagascar has become the number one sapphire exporter in the world; nowhere else can such a large sapphire belt be found. Ilakaka is a constantly growing sapphire boomtown along the RN7 near Isalo National Park Miners and middle-men from all over Madagascar arrive in Ilakaka to seek their fortune in the big sapphire rush. Since 1998, Ilakaka changed from a small village with only a few wooden huts to a long-stretched town with well-built stone buildings, churches and even a mosque. Nevertheless, Ilakaka is still the place to experience the wild west feeling close to what gold rush towns of some 100 years ago were like. Leaving Tulear by taxi bus (10.000 Ariary per person) in the direction of Antananarivo early in the morning, Ilakaka can be reached by midday. The tarred national road No.7 leads in an almost straight direction through wonderful plains and landscapes, passing small villages, zebu herds, large baobab trees and farmers working on their fields. 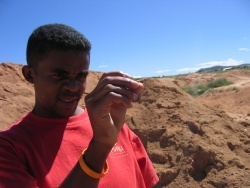 The first big gem trading town along the road is Sakaraha, 130km north of Tulear. From here it takes about one hour to reach the outskirts of Ilakaka. The taxi bus stops in the centre of the town at a restaurant. After some lunch it is the ideal time to calmly explore the town. The busiest hours of gem trading are in the morning from 7am to 9am and from 5pm to nightfall. In those hours countless gem shops are open and the main road is crowded with dealers, brokers and diggers. 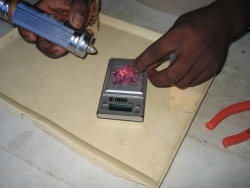 Most dealers are from Sri Lanka and Thailand, being experts in the enhancement of corundum and cutting of rough sapphires. Corundum is a rock-forming mineral: transparent specimens are used as gems, called ruby if red, and sapphire if any other colour. While Ilakaka is especially famous for the production of pink sapphires, some extremely fine blue sapphires are also found. 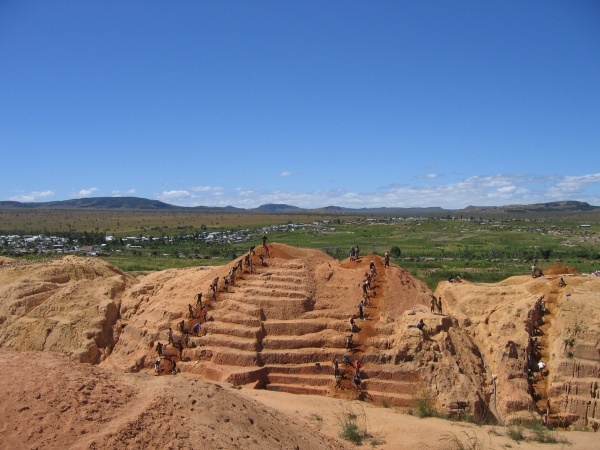 The mining follows the gravel deposits in the sandstone, lalam-bato - meaning the way of the stones in Malagasy. Mines are both open pits and shafts up to 30m deep. In the office of Color Line, a precious stone showroom and safari organiser, trips to the nearby mines can be arranged. In an organised mine, over 200 workers dig daily for sapphires with simple shovels and pure muscle power, leaving a giant hole appearing like an inverted pyramid. When a sapphire vein is exhausted, the owner of the mine moves his workers to a new location. Mining rights are owned by large mining groups. Conflicts between mining groups, miners, local villagers and traders sometimes result in violence. Unfortunately this has given Ilakaka a reputation for being a very dangerous place, but this is quite exaggerated. If tourists take care and keep an eye on their belongings, Ilakaka is no more dangerous than any big European city by night and absolutely safe to stay even overnight. One hotel we can recommend is the locally run Friends Hotel, with small, simple but clean bungalows. The Ilakaka mining area is huge, encompassing 4.000km² or more. 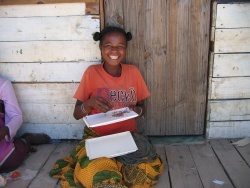 In Antsotramadoro, a small village near Manombo, only a couple of kilometres west of Ilakaka, an washed up sapphire deposit was recently found along a stream. It is a three kilometres walk from the village through beautiful fields and grass plains to reach the river, where villagers wash the sand in their search for sapphires. You are welcome to try your luck! "Tsy misy mandronono, tsy misy prix" - "If the stone is not milky, its owner will generally not obtain the best price from it." - A Malagasy proverb known by everyone in Ilakaka. This page was last modified on 6 September 2016, at 01:03.